Two hikers missing for five days on California's Mount Baldy have been found alive after rescuers tracked their footprints to their camp, according to authorities. Eric Desplinter and Gabrielle Wallace had gone hiking in the San Gabriel Mountains in San Bernardino County, California, on Saturday and were expected to return that night. But when the two hadn't returned by 8 p.m., friends reported the two missing. The San Bernardino County Sheriff said late Wednesday the two had been rescued after days of desperate searching. Authorities said rescuers found two sets of footprints in Cucamonga Canyon Wednesday at which point they alerted a search-and-rescue helicopter to fly over the area. The helicopter spotted Desplinter, 33, and Wallace, 31, at a campfire and lifted them to safety late Wednesday. "We're very grateful to be found tonight. I'm ready to get to bed and get some rest," Desplinter told Los Angeles ABC station KABC. The pair apparently lost the trail and when they tried to descend through a valley, it "was more treacherous than we thought," Desplinter said. "Best possible outcome we’ve been hoping for!" San Bernardino County Sgt. Jeff Allison tweeted. "Thank you to all of the Search and Rescue volunteers, aviation units, and our assisting agency partners. Training, hard work, and perseverance paid [off]." The two rationed food and drank water through a LifeStraw, which can filter dirty water. 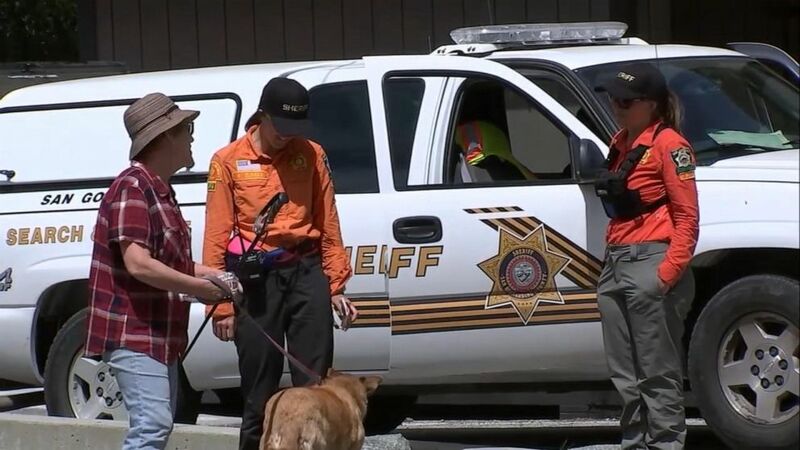 Rescue workers are searching the area around Mount Baldy and Cucamonga Peak in California's San Gabriel Mountains for two missing hikers who haven't been seen since April 6, 2019. Search teams had previously found their car at the bottom of the mountain. "Eric and Gabrielle will be flown to the Mt. Baldy Fire Station where they will be reunited with their families and loved ones, then evaluated by paramedics to determine if they need further treatment at a local hospital," the sheriff's office said in a statement. The Los Angeles County Sheriff's Office also assisted in the search, which covered 30 square miles over parts of five days. San Bernardino Sheriff John McMahon also thanked volunteers for their help in locating the missing pair. ABC News' Marilyn Heck and Emily Shapiro contributed to this report.